Posted on Tue, Feb 14, 2012 : 9:03 a.m. Sinking footings and porches detaching from buildings are among township officials' concerns at River's Edge. The Ypsilanti Township Board of Trustees on Monday approved taking legal action against the owner and receiver of a troubled townhome complex. Officials say both parties are ignoring township requests to address and reverse "deteriorating" conditions at the 162-unit River’s Edge Townhome complex, and, at their Feb. 13 meeting, the board unanimously approved giving staff authority to proceed with litigation. The property is located on Villa Drive near the intersection of LeForge and Clark Roads. Attorney Doug Winters told the board he had contacted the property’s mortgage holder, Citizen’s Bank, and the receiver charged with its maintenance and upkeep. Attorneys representing Citizen’s Bank contacted the township when officials were initially attempting to figure out River’s Edge’s ownership situation, but failed to commit to a meeting to discuss resolving the issues, Winters said. Without that meeting, he recommended the board approve court action as the next step. “At least when the board authorizes legal action it gets them talking and maybe they will now come to the meeting,” Supervisor Brenda Stumbo said. Deteriorating porches that are separating from the buildings. Citizen’s Bank took control of the property after the company’s last owner, Next Door Apartments - Villa Drive LLC, defaulted on the mortgage in early 2011. A Washtenaw County Circuit Court judge appointed Farmington Hills-based Finsilver/Friedman Management Corporation as the property’s receiver on June 1, and Finsilver/Friedman is now responsible for River’s Edge maintenance and financial management. Winters said the complex appears to have a high occupancy rate and questioned why tenants’ rent money isn’t going toward repairs. He said the items listed in the NOV are generally maintenance items but “important maintenance items” and he expressed particular concern over the sinking footings and porches detaching from the buildings. Next Door's mortgage dates back to 2007 in the amount of $5.6 million and records show it owes more than $307,000 in back taxes on the property. Finsilver/Friedman can either manage the property until the debt to Citizen’s Bank is paid off or sell the complex. “Staff, as well as our office, reached out in an effort to bring all the parties to the table to work out an agreeable timeline and an agreeable manner for proceeding, but if this is going to be difficult, then we are prepared to move forward as we have in the past,” Winters said. It’s one of several large cases the township is currently juggling. Staff has taken the first steps in the demolition process of the abandoned Liberty Square complex on Grove Road. A court recently ordered the owner of the partially abandoned Greenbriar Mobile Home Park to remove 14 mobile homes. Officials also recently learned of two more troubled mobile home parks on E. Michigan Ave. and Harris Road, which Winters described as “landfills” and has moved to the top of staff’s priority list. River's Edge is one of several problematic apartment complexes in the area. Neighboring Eastern Highland's ownership situation between jailed landlord David Kircher and Barnes and Barnes is in legal limbo. That has left several large buildings neighboring River's Edge vacant, though township building Inspector Ron Fulton said they are secure and safe. 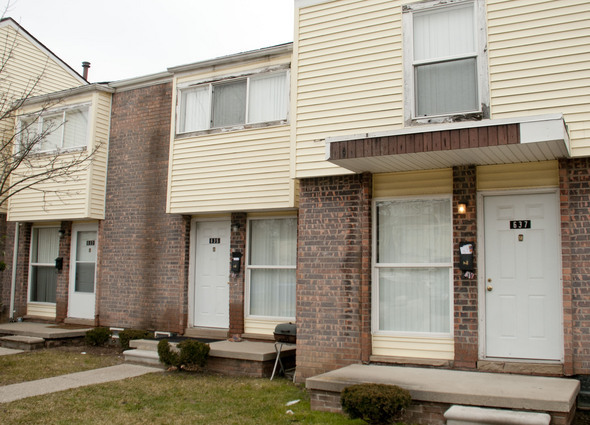 Across the street, Huron View Apartments, which is in the city of Ypsilanti, was hit with a rash of burglaries last year and management had refused requests by tenants for extra locks for protection. Sat, Feb 18, 2012 : 7:19 p.m. Wed, Feb 15, 2012 : 10:42 p.m.
GEEZ, be rid of it, and I'm sick of hearing about it. Tue, Feb 14, 2012 : 10:20 p.m.
&quot;Finsilver/Friedman can either manage the property until the debt to Citizen's Bank is paid off or sell the complex.&quot; I'm no lawyer but I think it's more complicated than that- Just who made this statement anyhow? The way I understand recievership Finsliver/Friedman are just to manage the property unitil the default to Citizens is repaid or the default becomes complete making Citizens the Owner. At that time Citizens can act on the property since they will be the owner and responsible for all other debts involved. If I am correct, the only thing Ypsi is going to accomplish by forcing a move now- rather than waiting for the ownership to be settled is the same as other neighboring properties. Finsliver/Friedman will have no choice but to evict all the tenants and leave the place vacant till ownership is resolved. This seems a bit extreme considering the nature of repairs listed above. Tue, Feb 14, 2012 : 6:59 p.m.
Who's ultimately responsible for the condition of the buildings? The bank that owns it or the company that manages it? Depending on the arrangement between the two I could see how it could be either one, I'm curious as to which it is in this specific case. Tue, Feb 14, 2012 : 10:18 p.m. There's, I think, a redemption periord for the owner, Next Door Apartments-Villa Drive LLC, so they still own it, but the bank has an interest due to foreclosure. The receiver has management responsibilities. Tue, Feb 14, 2012 : 10:13 p.m. The receiver is responsible for the condition of the buildings. The receiver is on the 30 yard line and moving fast, but the refs say it's coming back due to a legal foul. Tue, Feb 14, 2012 : 2:30 p.m.
Tue, Feb 14, 2012 : 4:11 p.m.
Mike, instead of putting a biased political spin on it and throwing out regurgitated &quot;just-add-here&quot; talking points, you could read the actual article and understand that &quot;the complex appears to have a high occupancy rate&quot;, and the attoreny for the Ypsilanti Township has &quot;questioned why tenants' rent money isn't going toward repairs&quot;. Of course it makes no sense to go after the owner(s) of the complex and hold them accountable... I mean if that were to happen, what would come of your right-tinged argument? It's obvious by your post which side you fall on, so why not drop the stealthly subtext you're trying for and say what's really on your mind?